Insert the flash drive. After it mounts, use df to find the file system name (for example, /dev/sdd1). 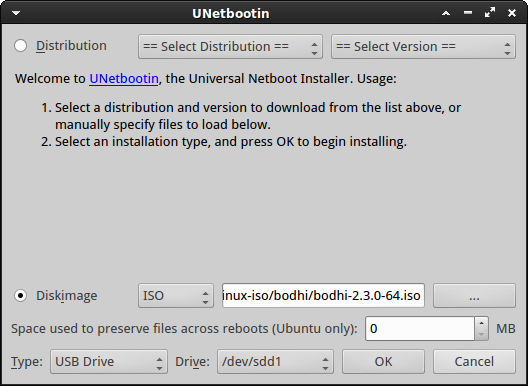 Run unetbootin. *** Requires sudo access. 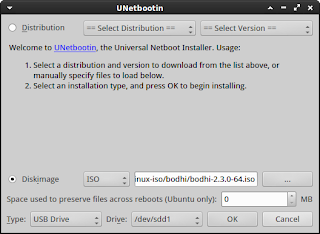 Apparently this is a known issue with unetbootin. Press OK and it will expand the ISO onto the flash drive. *** Warning: This will delete everything on the drive. Insert flash drive in target machine and boot away. You might have to go into the BIOS and select the USB drive as the bootable device, depending on the motherboard brand. Then sudo rm ldlinux.sys. (Fix taken from here). If you have an Intel motherboard and boot from a USB drive and get the message "Boot error", it could be due to the BIOS settings. This forum post describes how to fix the problem, which worked on one of my old computers with an Intel motherboard.